A common request amongst Twitter users is for timeline syncing across devices. Personally, I use Twitter on my iPhone, iPad, MacBook Air and iMac. Checking on one, then later checking on another can be a huge pain, as the locations within the timelines are separate on all devices. Recently Manton Reece released a new service named Tweet Marker. This is an API that authors of Twitter clients can take advantage, which will sync your location within the timeline up to a server, allowing other clients using the API to pull that location when you launch them. So if I check Twitter on my iPhone with Tweetbot, then an hour later load up Twitterific on my MacBook Air, Twitterific will automatically jump to wherever I was on the timeline when I exited TweetBot. It's a terrific service, and works very well. As a long time user of Twitter, I'm happy we've finally got something like this. One negative aspect of it (at least according to my understanding) is that the API is a little more focused on iOS devices. Namely, devices where you "quit" the Twitter app all the time, i.e. hitting the Home button. iOS Twitter clients taking advantage of Tweet Marker will explicitly sync their timeline position whenever you quit the app. On the Mac, this causes a bit of a problem. It's more common to just leave your Mac apps running, rather than quitting them whenever you want to switch focus to something else. This results in Twitterific on the Mac rarely syncing its current position up to the Tweet Marker servers. If I could remember to quit Twitterific whenever I walked away from my Macs this wouldn't be an issue, but that's not something I'm going to remember. What I needed was a way to automatically quit Twitterific after a set amount of time. They've got something like that coming in a future version, but even that functionality won't work for me. Namely, their support will only sync the timeline whenever the computer goes to sleep. My iMac *never* goes to sleep. I let the screen shut off, but my iMac runs a few server processes, so I can't have it sleeping. The eventual solution I came up with was a combination of SleepWatcher and Keyboard Maestro. SleepWatcher is a nifty little tool that runs in the background and can execute scripts of your choosing based on time-conditions. You can run scripts when the computer sleeps, when the monitor sleeps, after a settable idle time, when the computer wakes up, etc. What I want is to automatically shutdown Twitterific after my computer has been idle for 5 minutes. The two key aspects of this file are the --timeout=3000 entry, which tells it to use an idle time of 5 minutes, and -i ~/bin/quit_applications which tells it to run the script quit_applications after the machine has been idle (-i) for the time specified by --timeout. Where does that come from? Keyboard Maestro. 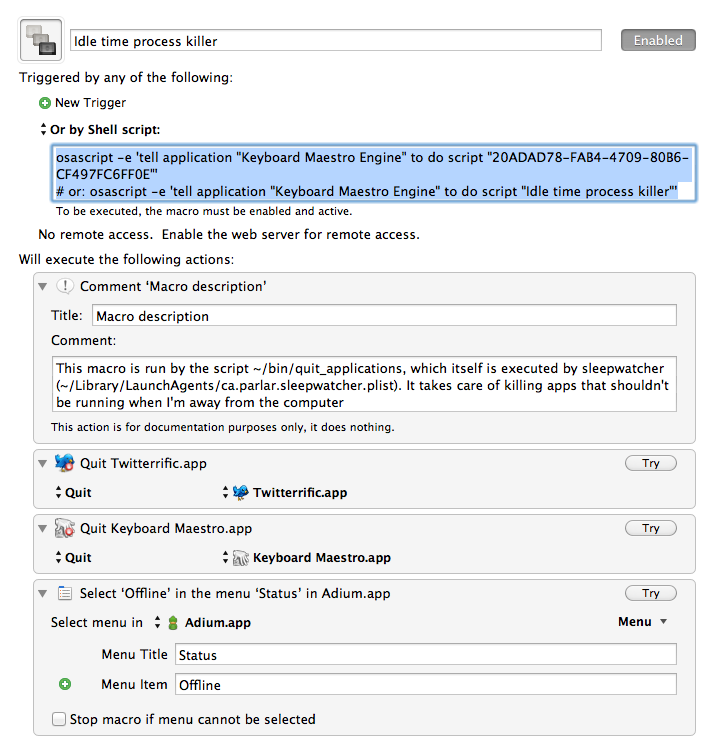 Keyboard Maestro is an application that can seemingly do anything. It lets you build very powerful macros that can be activated by keyboard shortcuts, menu drop-downs, scripts, and lots of other events. I've got the macro doing a few things more than just shutting down Twitterific after an idle time, and those can easily be changed to reflect whatever you might want to happen on your own system. Using this combination, I've now got Tweet Marker working quite nicely across all my systems. Twitterific gets shut down on my Macs after a period of time. As long as I don't run a Twitter client on my iPhone/iPad in the 5 minutes before the iMac has an idle event, then everything is great. Thanks again to Manton for the awesome Tweet Marker service, and the good folks behind Twitterific for Mac and iPad, and TweetBot (my current iPhone Twitter client). Thanks as well to Bernhard Baehr for SleepWatcher and Stairways Software for Keyboard Maestro. UPDATE (May 6, 2012): This is by far my most popular blog entry. If you read this post and feel it needs more detail, please let me know. A few months ago, I decided that I was sick of paying $40+/month for our home phone service. We use the phone often enough that I didn't want to just get rid of it altogether, but I certainly didn't feel I was getting my money's worth. This post is a summary of what I found in my search, and a basic description of my setup with my eventual VoIP provider. I started looking around, investigating which VoIP (Voice over Internet Protocol, i.e. telephone over the internet) options were available to me. My cable internet provider, Cogeco, has some reasonably priced phone packages, but as soon as you start adding "options", such as Call Display, Voicemail, etc., the price started to jump. I also looked into Vonage, the grand-daddy of consumer-level VoIP, but didn't feel that $19.99/month was cheap enough to "risk" moving to VoIP. What risk am I talking about? The traditional phone system we're all used to, POTS, is incredibly reliable. Try to come up with the number of times in your life that you picked up your phone and there was no dial-tone. The number is probably somewhere in the vicinity of 0. Even in a power outage, POTS works just fine. Going VoIP means you're losing some of that reliability. You're taking a risk that the phone won't work when you need it to. We've all had our home internet connections go down, and experienced power outages. In either of those situations, VoIP won't work (note: You can get some battery-back-up solutions for VoIP setups so that you can still use the phone in a power outage. But these aren't the norm). I did some more searching, and eventually voip.ms crossed my path. They're a Canadian-based VoIP provider (though they offer service to anyone in the world) with a fairly high reputation. One problem in the VoIP community seems to be an abundance of fly-by-night operations that might not be around in a few weeks. voip.ms has been around for awhile, and it doesn't look like they're going anywhere. The initial advantage to voip.ms was cost. It's a pay-as-you-go system. Minimal-to-zero fixed monthly fees, and you only pay for the phone calls you make and receive. There are different prices for incoming and outgoing calls, and for each you can choose whether you want "Value" or "Premium" routing. The Value routing costs about half of the Premium, but sound quality often won't be as good, and Call Display isn't guaranteed to always work. The Premium routing only costs 1.25 cents per minute for outgoing calls, and 1 cent per minute for incoming, so just do that. With voip.ms, you can port over your existing phone number. There is a $25 cost associated with this, but it's a one-time thing. The amount of time for the port to happen is dependent on your existing phone provider. I was previously with Primus, and it took about a week before my number was moved to voip.ms. You can actually assign multiple phone numbers to your account, which can be used for a variety of purposes, which I'll get to later. The only fixed monthly-costs I have are related to the phone numbers. Each phone number you keep will cost between $1 and $2 per month, depending on which region the phone number is from. That's right, you can order phone numbers from almost any area code in North America, and assign them to your home phone. Have a relative that's too cheap to call you because they don't want to pay long distance? Just buy a phone number in their region, and they can thereafter make local calls to you. Most phone numbers only cost $0.50 to purchase, with the previously mentioned $1-2/month fixed cost. In addition, any phone number that you want to support 911 calling will cost an additional $1.50/month. I personally have two phone numbers on my account, and 911 service tied to one of them. This brings my monthly fixed cost to $3.50. I previously mentioned that while Cogeco was initially cheap, any calling features you added on later would increase your monthly bill. Not so with voip.ms. You get Call Display, Voicemail, Call Forwarding, custom Interactive Voice Responses (IVR), Email-forwarding of voicemails, Caller ID Filtering (i.e. block telemarketers), and more. All included. One of the coolest things is the way they implement Caller ID Filtering. You can create custom rules which trigger actions based on the phone numbers of incoming calls. You can automatically send certain numbers to voicemail, automatically send phone numbers –—or even entire area codes— to an IVR, automatically hangup on incoming calls matching rules you create, and lots more. In particular, I've created an IVR that gets activated on calls from certain telemarketer-heavy area codes. When a caller from one of those area codes calls my number, they get a recording of me, saying "Press 1 if you are a telemarketer, press 2 if you are not". If they press 1, it automatically hangs up on them. If they press 2, then the call continues and my phone begins to ring. Anytime I get a call from a telemarketer in my own area code (which I can't filter out based on area-code alone), I hang up on the telemarketer, and log into my voip.ms account. Then I create a new rule specifically for that telemarketer's number. The next time they try to call me, they'll automatically get hung up on without my phone ever ringing. In addition, I've got a rule that sends any calls with blocked Caller IDs to the IVR I described before. The great thing is that a lot of telemarketers use robo-dialers to make the initial call, and a human only picks up the phone once I answer and start talking. Those robo-dialers get tripped up by my IVR, and usually automatically time out after 30 or 40 seconds. The end result of this is that my cellphone is simply receiving an incoming call. My VoIP account is making two outgoing calls. One to my cellphone, and one to the number I entered when presented with the dial-tone. So the total cost to me is then $0.0125*2 = 2.5 cents per minute. WAY cheaper than what my cellular provider charges. The VoIP hardware I chose is the Cisco/Linksys PAP2T. I got it from Canada Computers for about $50. One brilliant aspect of VoIP is that it's incredibly easy to wire into your existing home phone lines. Simply disconnect the line coming in from the street (usually done at a junction box outside your house), and plug the PAP2T into any phone jack in the house. You'll be able to continue to use all the phones you already have in your house. The PAP2T does need to be configured with appropriate settings for voip.ms, and other random things that I don't really understand. Your best bet for configuring both your voip.ms account and your PAP2T is to follow the large number of guides that take you through it step-by-step. The fine folks at the DigitalHome.ca VoIP forums are also quite helpful. voip.ms themselves have excellent customer support. It took me a few hours to get everything configured exactly as I wanted it, but ever since it's been working beautifully, and I'm average about $6.50/month on home phone service instead of the $40+ I was paying before. Even factoring in the cost of buying the PAP2T, the switch to voip.ms more than paid for itself within two months. Call quality has been phenomenal, and everything has *just worked*. I ended up staying away from the particulars of my setup in this post, but if there's demand, I can write another one going into more of the details about a decent voip.ms configuration, and explain some of the other terminology they use.